There's nothing like a race track full of beat-to-hell hoopties to give you a crash course in Blowed Up Engines 101. The Southern Discomfort race offered plenty of busted blocks, oil pans full of bearing shards, and the like. The top image shows a fairly standard BMW M20 thrown-rod "after" photo. 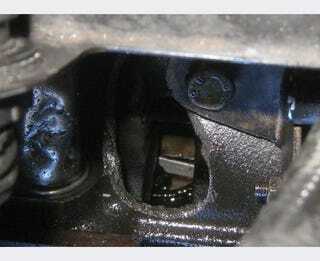 Above, we see a Toyota 4AGE oil pan with bits of damn near every major engine component in a soup of sparkly iron-fortified oil; when a high-mile engine lets go at 8 grand, you're lucky the if oil pan catches most of the chunks. Speaking of oil pans, what do you do when newly liberated rods make their escape through the bottom of your Ford Windsor's pan? Buy a junkyard short block and patch the pan, of course! When the race-leading Ford Probe's engine blew up, it wasn't just your regular ventilated block. Check out that big crack- broken nearly in half!